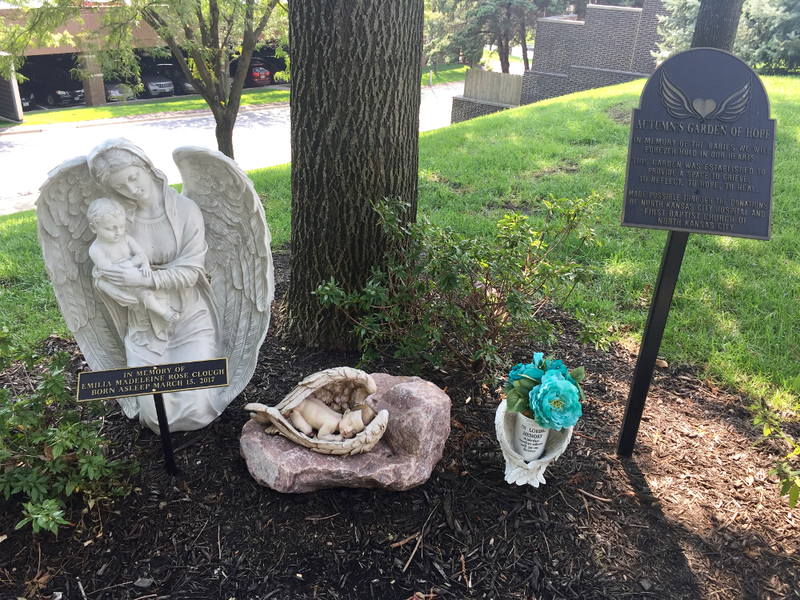 In October 2016, North Kansas City Hospital dedicated a peaceful sanctuary on-campus that serves as a place of hope, healing, and remembrance for families who have loved and lost a little one. Autumn’s Garden of Hope has provided our family a space to grieve, heal, and retreat to when we need a peaceful place to reflect on the memories of our daughter. We are incredibly honored to have two sculpture pieces permanently placed in Autumn’s Garden in memory of Emilia. 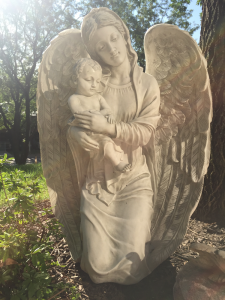 The Devoted Protector Guardian Angel Statue stands two-and-a-half feet tall and depicts an Angel knelt on the ground with an infant child cradled in her arms. This statue represents the moment our children enter Heaven and how never once are they ever alone. 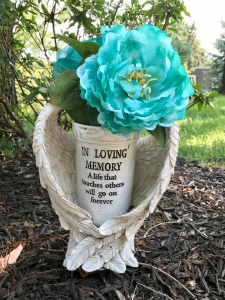 The Infant Memorial Vase is sheltered within a pair of beautiful angel wings. Inscribed on the vase reads “In Loving Memory – A life that touches others will go on forever”. Although some babies come into our world and only stay for a little while, they leave a huge and lasting impact on our lives. We hope that other families find peace and comfort in Autumn’s Garden of Hope. May they admire the statues and memorial vase and be reminded of their child and the love that will always be shared. We would like to thank several family members, friends, and strangers who have made donating to this garden possible. 100 percent of the funds used to complete this project were given to our family through donations from several patrons. If you find yourself in the Northland of the Kansas City Metro and would like to pay your respects, you can find Autumn’s Garden of Hope on the East side of North Kansas City Hospital in the green space next to the NorthCare Hospice House. Emilia’s statue and vase were dedicated on October 15, 2017, at Autumn’s Garden of Hope. Following the dedication was a Walk to Remember and Infant Loss Reception hosted by North Kansas City Hospital’s Maternity Care Infant Loss and Bereavement team. This event coincided with Pregnancy and Infant Loss Day and coincidentally fell on the 7-month Anniversary of Emilia’s birth and passing. North Kansas City Hospital’s Infant Loss Garden… Autumn’s Garden of Hope.